The Days of Johann, an agility dog! 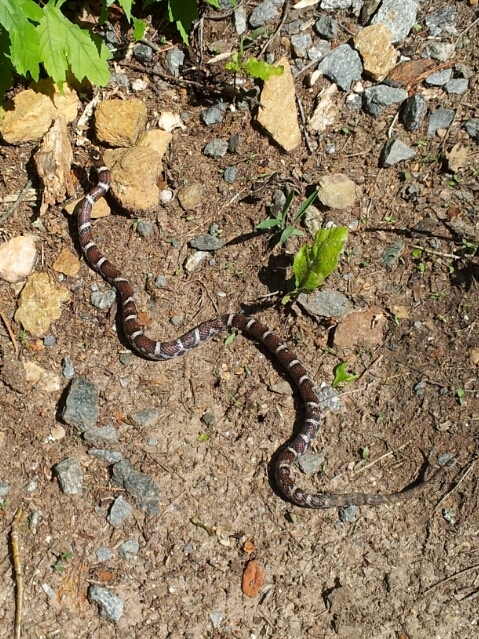 : The snake that bit me! The snake that bit me! 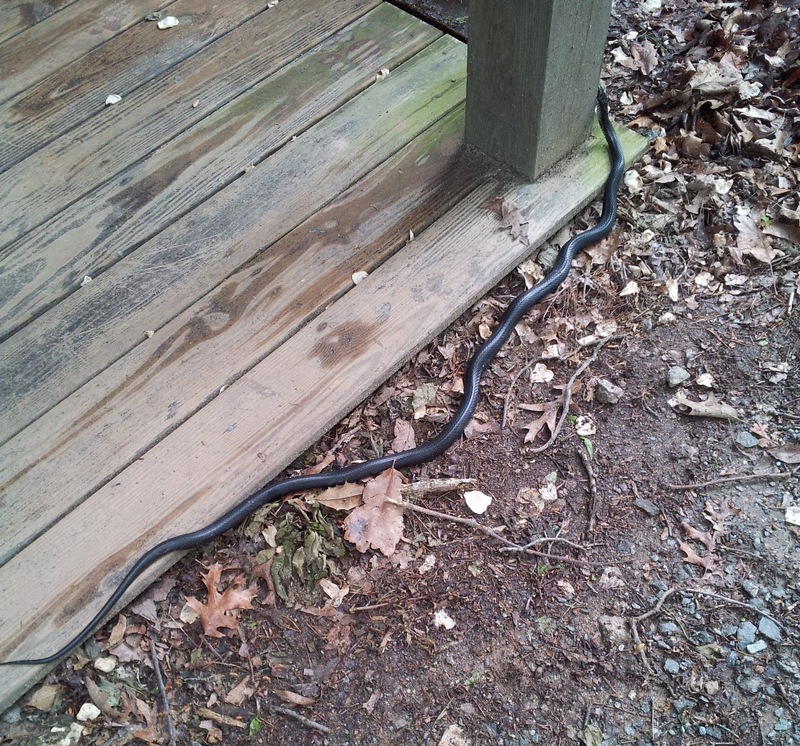 It's May here at the cabin and that means snake time! 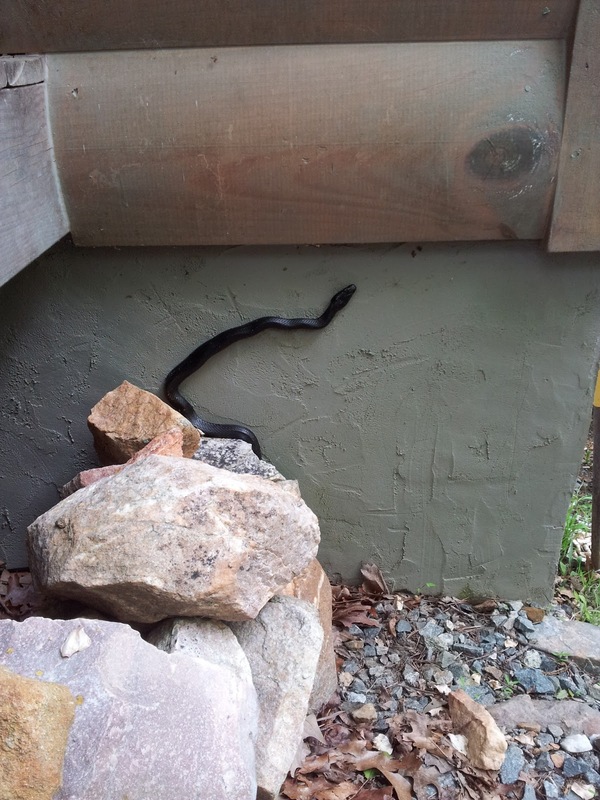 Snakes are very active here on our mountain in April/May and October/November. So Mum is keeping a good eye out for us. A week or so ago, we were hanging out in the yard when it started to get to be dinner time. Mum got us inside, then waited a little to see where the snake went, as it crawled under the front deck, Mum watched it then it started to come out from under the deck and crawl up the side of the cabin. That's when Mum saw her opportunity. Mum waited just a bit, got the three pronged rake, careful placed it between the snake and the cabin wall, scooped up the snake and took it down the lane and placed it on the other side of the road. Then willied out all the way home, BOL!!! 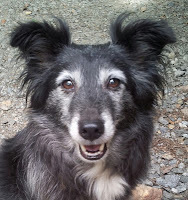 I have to say that even though some of these snakes are good snakes and keep the bad snakes (aka, copperheads in our area) away; she still doesn't like them, and worries that little me, even if bitten, could possibly require a trip to the vet if the bite connected well. Heck my little legs are only about the size of a quarter in diameter! So she was happy to get this one out of our fenced in yard. Then just a few days later, Mum was sitting on a log in the yard, as Gracie and I sniffed around. I started trotting over to Mum when I stopped about three feet from her, looked over and saw something interesting. I pawed at it and it coiled and struck. Mum was pretty certain it wasn't a copperhead, too bright brown and didn't have diamond shapes on it. But just to be certain she took a photo, sent it to our very knowledgeable vet (she's kind of an expert in the snakes and tick diseases that dogs encounter around here), and yep, total confirmation it was a Milk snake. Mum cleaned up my snout, put a little peroxide on it, let it bubble and I'm no worse for wear. It didn't bite me too badly, heck the kittie scratches were a whole lot worse than that. So the only snake we haven't seen yet, is the copperhead. Mum is keeping a vigilant eye out for us! Our mom doesn't like snakes any more than yours does, Johann! Be very careful! Oh, this all sounds quite scary. I'm not super scared of snakes for myself - we have them here even in the suburbs and they're dangerous - but I'm alway nervous Penny will sniff at them and get bitten on the nose, just as happened to Johann. I'm so glad it wasn't a poisonous one. So glad you haven't run into a poisonous snake yet, especially when you were bitten. Your mom was brave. Thanks, Johann, for coming over to my blog and giving me such useful info about paw burn.